Available in Em, F#m, Gm and Am. Also Available in the "Rainbow Style"
One of my most popular flutes, the Tiger Maple flute is a natural beauty. I use no dyes or stains on this wood. They are hand-rubbed with Tung Oil before the final finish is applied and this brings out the fascinating grain. Each flute is unique. I pick wood with the best possible figure for these flutes. They are available in the following keys: F#m, Gm and Am. (Good for most hands, around 23" overall length.) And Em, a lower pitch which might be difficult for small hands or beginners as they are around 26" overall length. See Measurement Chart Below. These flutes are in constant demand, so it is possible that I'll be making this flute especially for you. Listen to sound samples of the different keys here. Also, if you're looking for a great book/CD to learn with, you might want to check out "Understanding the Gift", below. These flutes are available from me in most of the popular keys. See key selections and opportunities to purchase below. Click here to see approximate sizes of different keys. Top View of the Rainbow Flute. Semi-precious stones are inlaid into the top to represent the different areas of the Chakra. 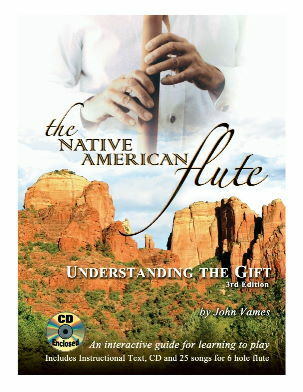 This Native American flute is the inspiration of my guiding light and wife, Amelia. She has suggested that I create a "Rainbow" flute which adds a little variety and color to the beautiful figured Tiger Maple used to create this Indian flute. Inlaid with semi precious stones in the colors of the rainbow, the Rainbow Flute not only plays with a tone that is sweet and pure, but also inspires with the different colors of the rainbow. We're using 4mm cabochons so as not to confuse the fingers as to which is a finger hole and which is a cab which is inlaid just below the surface of the instrument. Starting at the base with the root color red we're using Garnet. This is followed by orange Carnelian, yellow Citrine, green Chrysophrase, blue Turquoise, violet Iolite and crowned with purple Amethyst. The bird on this Indian flute is made of Eastern Red Cedar. Click Here to listen to the Rainbow Flute in F#m. One of the most visually striking woods that I use is Tiger Maple. It comes from the Northern United States, and Canada. This particular wood really stands out when exposed to direct sunlight. This flute is available in the keys of Am, Gm, F#m. The Em is a long flute. I do not recommend it for beginners unless you have flexible hands and/or long fingers. However the F# Gm and Am are a better size for average hands and people who want to start out with a high quality, beautiful instrument. You may have seen this type of wood used in violins and guitars. The intensity and pattern of the figure will vary with each instrument. The sound of this flute is smooth and mellow. I know this one will have a special place on your collection. Each Laughing Crow Tiger Maple Flute is sealed with Danish Oil and finished with at least four coats of clear acrylic polyurethane. Tiger Maple is a robust wood. This finish strengthens the wood and makes it more durable as well as waterproof. The finish also protects the wood from UV rays which will cause the color to change unless otherwise protected. I have meticulously tuned these flutes with a digital tuner. This means that you can play along with other instruments and be in tune with them, also known as 'concert tuning'. The flutes pictured are examples of the different shades available. Yours will probably be slightly different. However, be assured that this wood is hand-picked . These instruments are created from only the most beautiful and perfect wood that I can find. 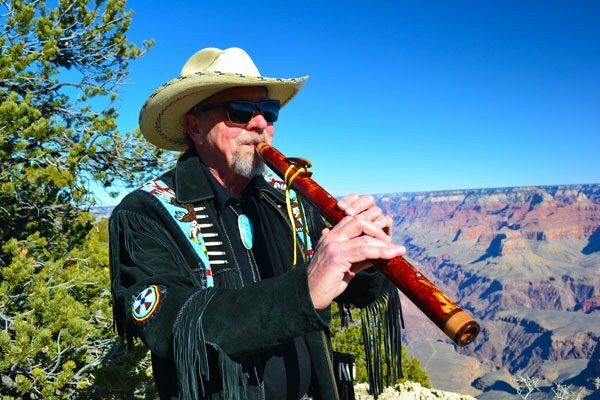 I am confident that you will be not only more than satisfied with the tone from my Native American style Tiger Maple Flutes, I also know that this flute will stand head and shoulders above anything comparably priced. The tone is better, in my humble opinion, than that of some flutes costing hundreds more. This flute is made with the same precision, voicing, tuning and care that I give to all my flutes. This Native American style flute is a great value. 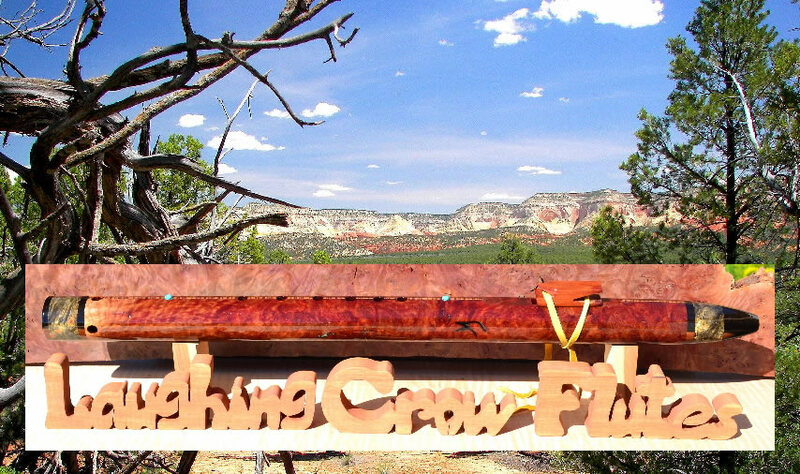 Take advantage of this opportunity and get yourself a professional quality Laughing Crow flute that you will be happy to play for a lifetime. As with all Laughing Crow Wooden Flutes, this flute comes with a turquoise cabochon and a free felt case. List of different keyed flutes and their average sizes for Laughing Crow Wooden flutes. Am Flutes - Length=22" Hole Spacing=11/16" (farthest two holes) Hole Size=5/16" Outside Diameter=1 1/4"
Gm Flutes - Length=23" Hole Spacing=1 3/4" (farthest two holes) Hole Size=3/8" Outside Diameter=1 3/4"
F#m Flutes - Length=24" Hole Spacing=1 7/16" (farthest two holes) Hole Size=3/8" Outside Diameter=1 3/4"
Em Flutes - (The size that can be difficult for some hands.) Length=26", Distance from mouthpiece to farthest hole-20", Hole Spacing=2" between last two holes, 1 3/4" between holes two and three " Hole Size=3/8"" Outside Diameter=1 1/2"